For 20 years, I wanted to meet Edoardo Valentini at his winery, but he did not welcome visitors. Finally, the opportunity presented itself and a group of wine writers and I were standing before him in his home. We found the great winemaker seated in a throne-like chair with his son and grandson standing behind him and his wife and daughter-in-law off to the side. It reminded me of a scene from a Fellini movie about Italy in the 1930’s. We were not invited to sit down. 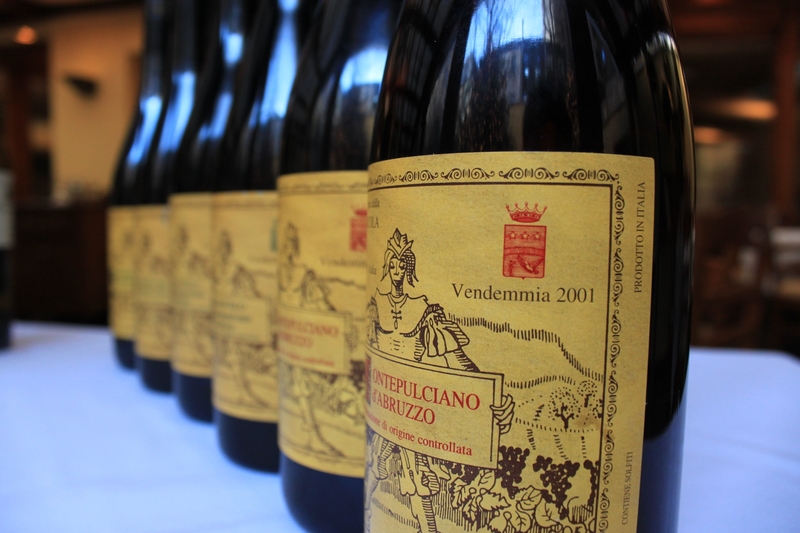 The wine writers had many questions but Valentini offered few answers. He said that he sold 90% of his grapes to a local co-op (Rosciano, which we also visited) and kept only the best for himself. He would not show us the cellar or explain how he made wine. All he would talk about was the terroir and the grapes. We returned to his house and were all standing around not knowing what to do. Michele turned to me and said, tell him we are friends of the late Sheldon Wasserman and his wife Pauline. I told him in my best Italian and suddenly he became silent. He looked up at us with tears in his eyes and began to praise Wasserman. Sheldon and Pauline were the authors of The Noble Red Wines of Italy and were the first to praise Valentini’s red wine and pronounce his white and rose the best in Italy. They all became close friends. He asked if I knew where Pauline was and I said I had seen her the year before but had lost contact with her. All of a sudden we were invited to sit down and his wife brought out two pies she had made along with other foods. We ate, drank his wine, talked about Wasserman and wine and he was a like a different person. When we were about to leave someone asked if we could buy some wine. He said no but he would give us wine. He gave us the white and the Cerasuolo, his rose, but would not give us any of the red. He said that he had very little red wine as he used most of his red grapes for his Cerasuolo. He said that he liked his white and rose better than his red. After talking to him and drinking his wines I understood what the term “terroir driven” wine really means. This was one of the last stops on this press trip and I had been given a lot of wine. I told the other people on the trip that I would trade bottles of other producers’ wines for bottles of Valentine’s wine. Three for one, six for one it did not matter, I wanted the wine. 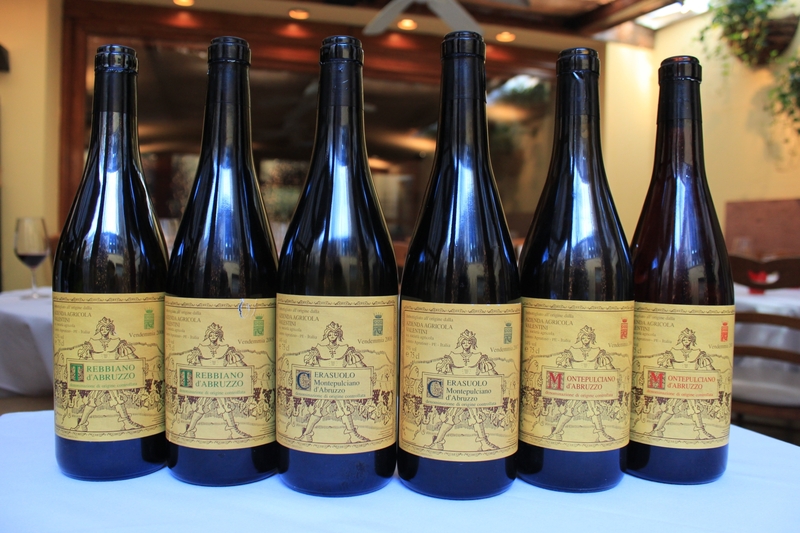 I came back from the trip with eight bottles — all Valentini. Edorado Valentini passed away at age 72 in 2006. I was glad that I had the opportunity to meet him and to talk to him and learn more about his wine. It was Sheldon Wasserman that had first told me about Valentini and his wines and was the one that urged me to go and visit him. For those that knew both of them they were two of a kind! Edoardo’s son, Francesco Paolo has taken over the wine making and I was very curious to see if there were any changes in the wine. I was able to try them at a tasting arranged by the importer, Domenico Valentino Imports, at I Trulli Restaurant. 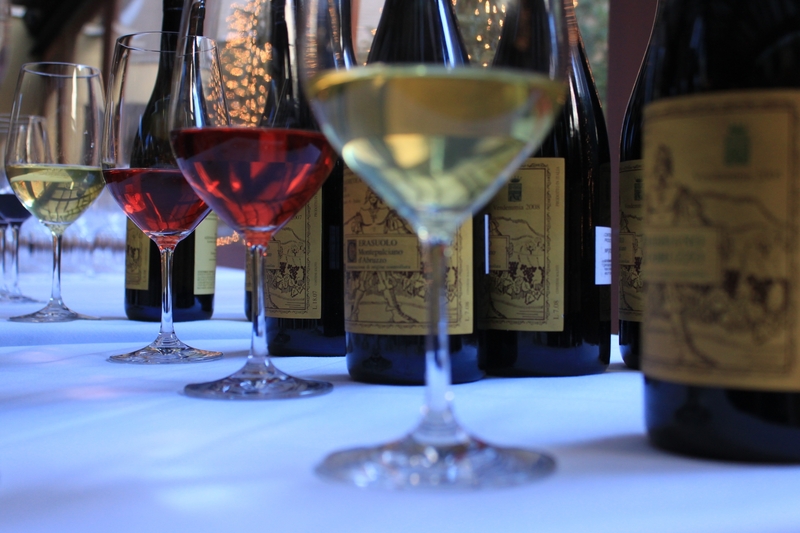 The wines of Valentini – organic and biodynamic production. Trebbiano d’ Abruzzo 100% Bombino Bianco ?? DOC 2008. This is a very complex full wine with a lot of fruit, mineral undertones, good acidity and a great finish and aftertaste. Wine writer Jancis Robinson in one of her books says that the grape for this wine is not Trebbiano d’Abruzzo but Bombino Bianco. In the technical sheets given out by Domenico Valentino, it says Bombino Bianco. They said that the information was given to them by the Italian distributor and the blanks on the technical sheets were filled in by Francesco Valentini. When this question came up when I was at the winery, Edoardo Valentini said that the grape was Trebbiano d’ Abruzzo. I guess I will just have to go back again and talk to the son. However, no matter what the grape, it is a great white wine. Trebbiano d’Abruzzo DOC 2005 this was a little more developed, very complex and full with a mineral character, hints of citrus fruit and apple, good acidity, great finish and aftertaste with that extra something that is difficult to describe. Montepulciano d’Abruzzo Cerasuolo DOC 2008 100% Montepulciano d’Abruzzo Aged in large botti of Slavonia oak for 12 months. There was just a touch of strawberry in the wine but that may be the only thing it has in common with other rose wines. Montepulciano d’Abruzzo Cerasuolo 2007 aged in large botti of Slavonia oak for 24 months. More developed with very nice fruit aromas and flavors, mineral character and for a rose a great finish and aftertaste. Montepulciano d’Abruzzo 2006. This wine was big, rich and tannic with wonderful red and black fruit flavors and aromas. It needs many years to develop. Montepulciano d’Abruzzo 2001. At 10 years old it was not ready to drink. It still has a lot of tannin but with plenty of red and black fruit aromas and flavors. I have a few bottles of the 2001 and I will not open them for a few more years. 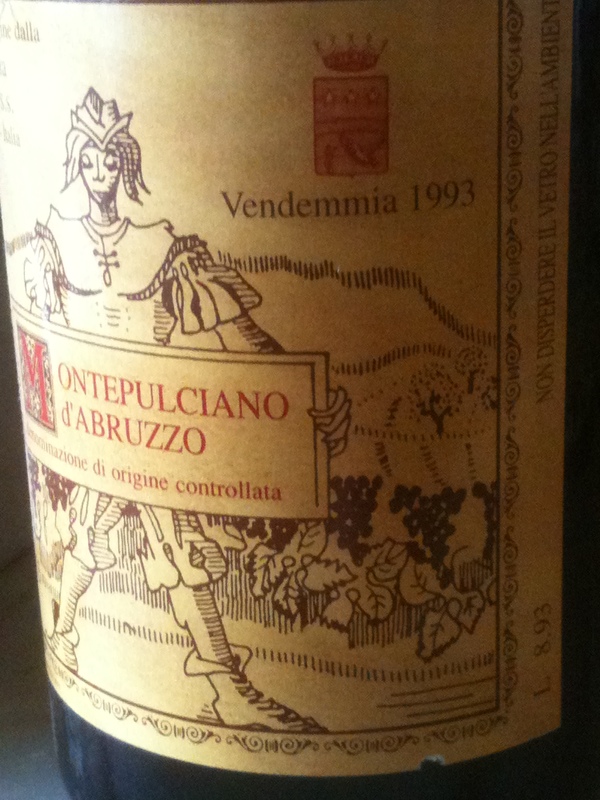 I also have one bottle of the 1993 and I am thinking of drinking it soon. 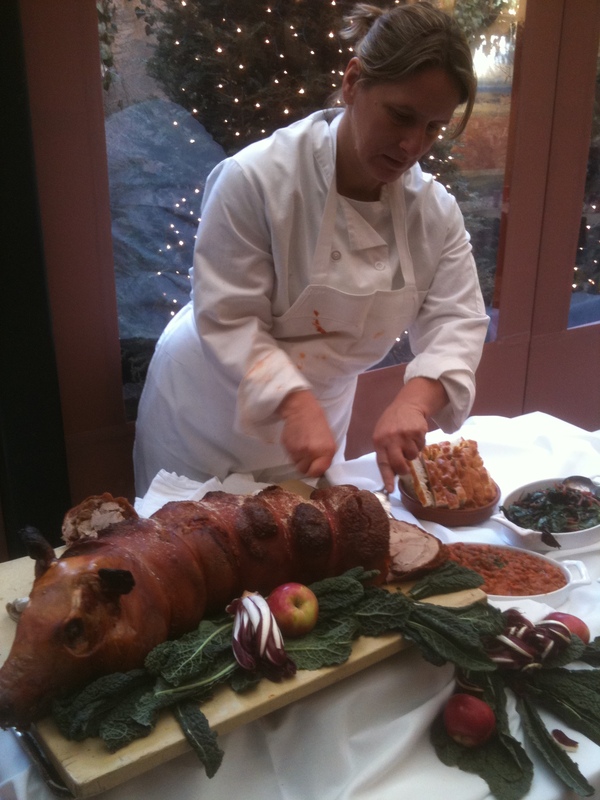 I Trulli’s chef prepared an entire roast suckling pig for the occasion. Not only the red but also the white and the rose went very well with it. One of the things that impressed me about these wines was their great finish and aftertaste. Edoardo Valentini’s tradition continues with his son Francesco and the winery is the Gambero Rosso winery of the year for 2011.